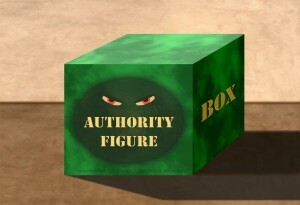 Authority figures can form the sides of the boxes outside of which we’re trying to think and develop. Authority figures help in many ways, providing expertise, guidance, definitiveness and certainty. We’re taught to respect them too. Yet, they can be dangerous. While easily seeing this when they abuse power, it’s difficult to see when their intentions are prudent. The article, “Just Thinking You Slept Poorly Can Hurt Your Performance” (Harvard Business Review, September 2014 edition), covering research by Kristi Erdal (Colorado College) hints at this. As with medical placebos, there are psychological ones too. Common ones are superstitions. Authority figures can be too. That is the danger. Sleeping poorly affects performance. Erdal found that perceptions of sleep matter too. Regardless of how participants slept, if they perceived sleeping well, they performed well; if perceiving sleeping poorly, they performed poorly. Authoritarian influence worked on eighty-eight percent of participants, convincing them of a sleep they didn’t have. Thus, authority figures are major contributors to this psychological placebo effect. That’s why the influence of medical placebos is largely attributed to the practitioner. It’s why leaders can inspire us to go beyond the possible. As mentioned above, authority figures can exert a negative placebo effective innocently without malicious intent. This easily happens when we pressure and expose them by asking for predictions on highly variable and uncertain circumstances. Researching soft disciplines such as leadership are particularly vulnerable to the unintentional placebo effect. As authority figures enjoy success, conservatism increasingly influences their decisions. Conversely, if needing publicity or status, they are prone to wild predictions. If authority figures can convince us we had a bad night’s sleep when we didn’t, then they can convince us we can’t do something when we can. When they say someone wouldn’t be a good hire, it’s not because he would be. It’s because they set expectations in our minds that he won’t be. Therefore, when thinking outside the box, we will often find authority figures forming some of the sides. Sometimes these declarations have a contrarian effect, spurring us on to prove them wrong. Still, we are the governors of our minds. We must be wary who claims authoritarian status in them. John, I perhaps should have said we expect authority figures to provide certainty. Whether they do in an objective sense is an implied point in the post. Nevertheless, they do help people feel more certain about their decisions. When I included certainty, I was focused on the roles expert witnesses play in moving jurors beyond a reasonable doubt. In those cases, even though expert witnesses can offer conflicting testimony, we still expect authority figures to help us make decisions with a fair degree of certainty. I also see this expectation of certainty play out in business when advocates of particular views will say something to the effect of “I talked to [authority figure], and he confirmed that . . .” or worse yet, “I talked to five experts and they all confirmed . . .” Much of the problem too isn’t necessarily with authority figures themselves. It’s also with those who use authority figures. It’s very easy to have what authority figures say translated into what we want them to say. I believe those thought to be experts (and those in authority if also experts) can be expected to add clarity most likely but I’d still argue against certainty. As to the expert witnesses, I always worry about their being too confident, too incomplete in learning specifics, or worst of all, too willing to believe specifics don’t matter. Don’t get me wrong, capable experts can ask good questions, provide clarity, and facilitate optimum approach to specific situations – IF they choose to do so. But I still don’t think they can provide certainty. Things can easily go much worse!! !